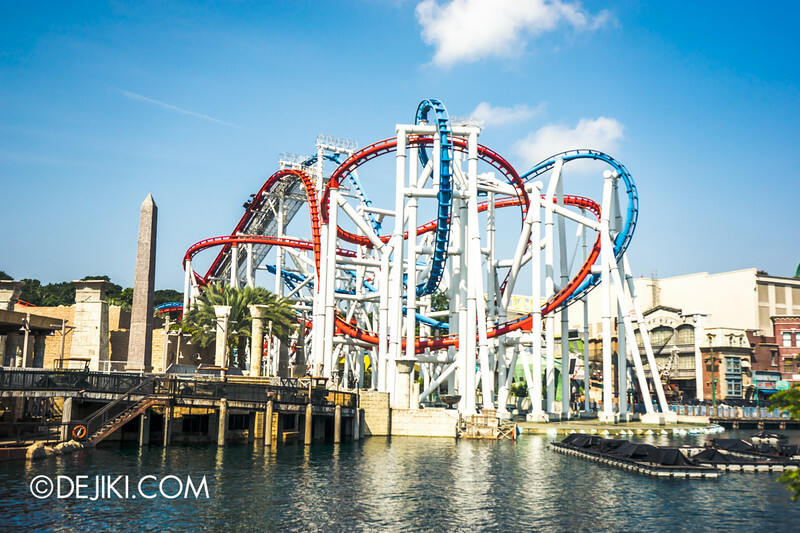 The Battlestar Galactica (BSG): HUMAN vs CYLON dueling roller coasters attraction is on track to reopen at Universal Studios Singapore, as the park moves on to the re-certification process. With the ongoing extensive coverage on Halloween Horror Nights 4 at Dejiki.com, this month’s update will be short and sweet. 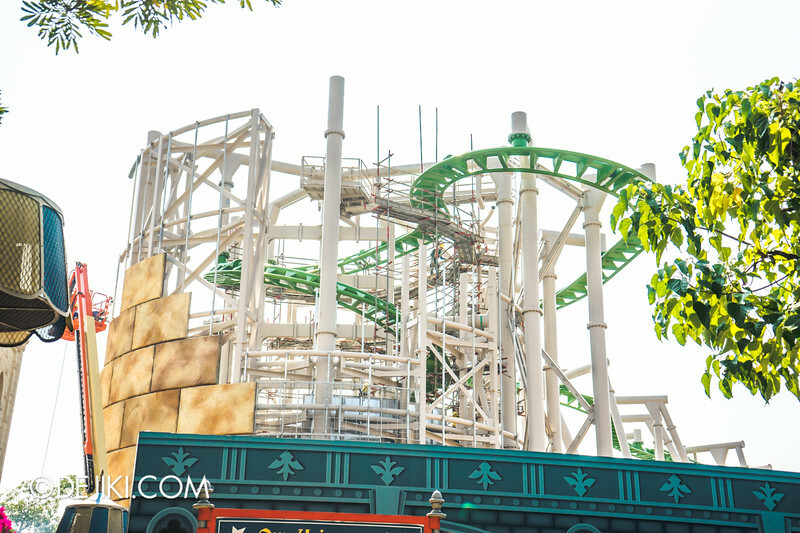 04/11: To prepare for its reopening, Universal Studios Singapore has started testing Battlestar Galactica roller coaster in the day. It looks like both attractions, the crown jewel of USS, will be ready in time for reopening end 2014 or early 2015. In short: BSG is going to reopen. soon. Local paper The Straits Times reported that the park submitted technical and support documents to the local authorities. This is part of the process to certify the ride’s safety modifications and ultimately, obtain the license necessary to operate the ride. Testing and technical rehearsals will commence soon as part of the process, before the ride can be opened to park guests. While the timeline for reopening is unclear, the park’s target is to reopen its star attraction by end of 2014, as hinted by a statement in Genting Group’s financial report. A formal announcement is expected to be made soon, possibly towards the end of this year’s HHN4 season. Even if there are unforeseen delays in the process, the ride should be back and running before the second half of 2015. In the past few months, ride engineers and all sorts of equipment have been spotted at the park to facilitate the reopening of the roller coasters. Modifications to the track were also done, whether it’s additions of elements (that look like trim breaks) or even redesigned track segments. Certainly, a lot of things were happening in the background of the seemingly quiet roller coaster site. 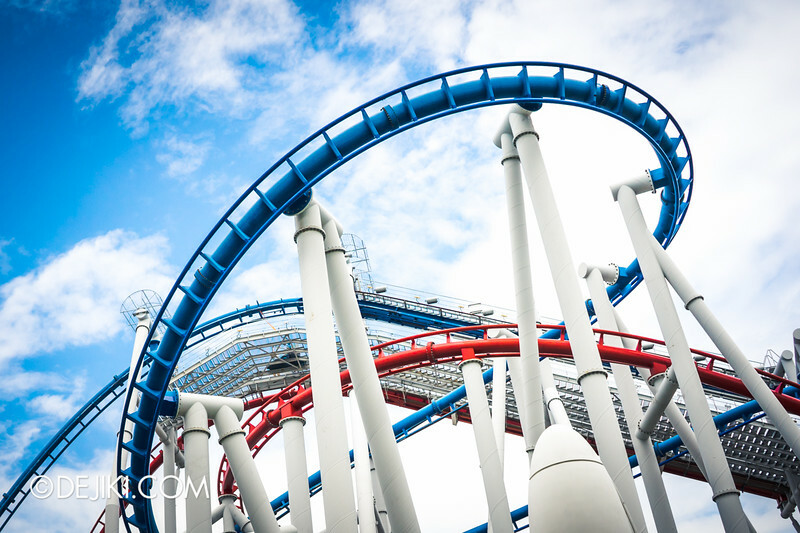 Once the ride is back in service, it will return as the one and only dueling roller coaster attraction at a Universal Studios theme park around the world. A few weeks ago, a test vehicle has been spotted at the top of the HUMAN (red) launch track. 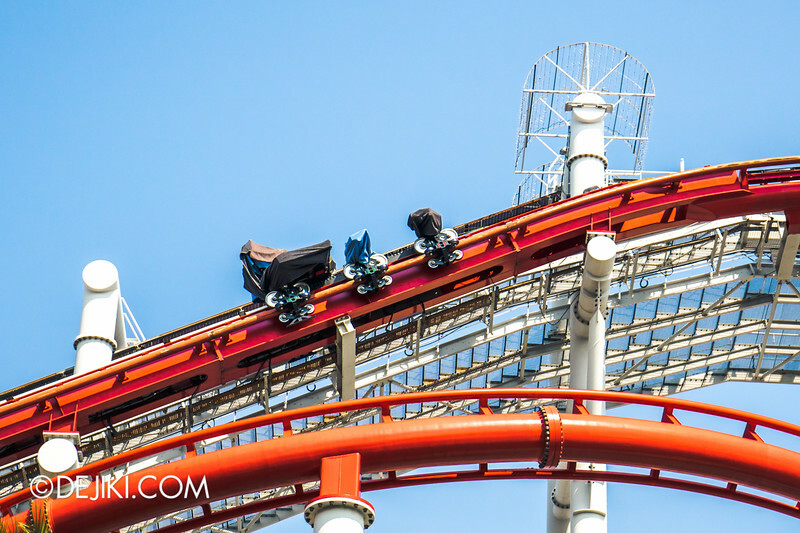 Apart from track modifications, the ride vehicle is rumoured to be modified or redesigned with a lower capacity (i.e. two or three guests per row). This test vehicle seems to also suggest this possibility, but we can’t be sure of all things. 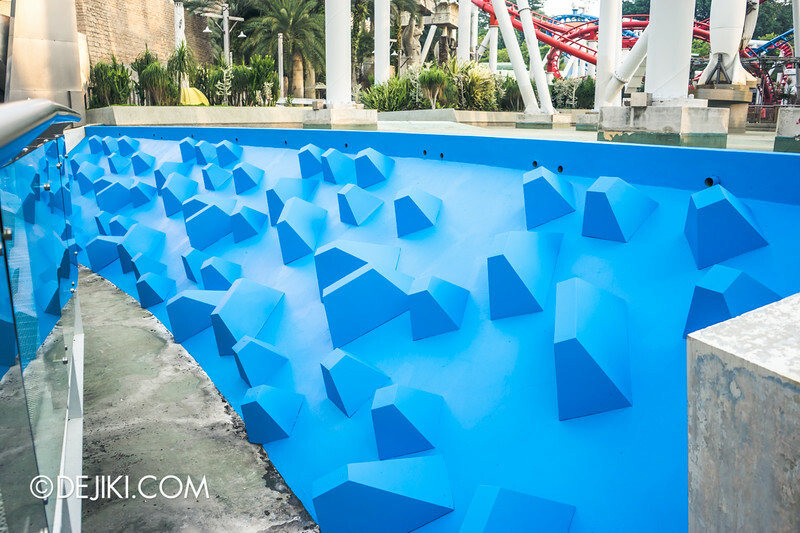 The lagoon below the roller coaster tracks have also been recently repainted! What a lovely and clean shade of blue. Construction has been moving on rapidly at Puss in Boot’s Giant Journey. 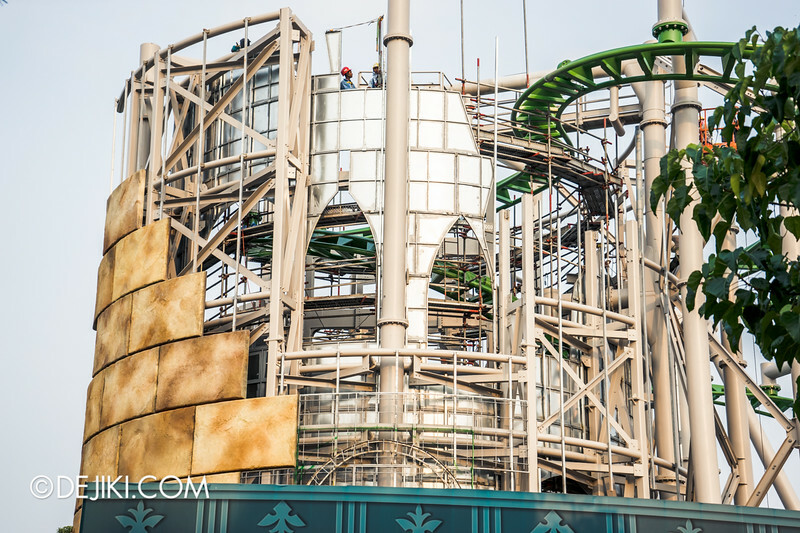 In just a matter of weeks, the steel cladding for the iconic structure went up, along with decorative wall pieces. This is going to be a tower wrapped with a giant beanstalk. 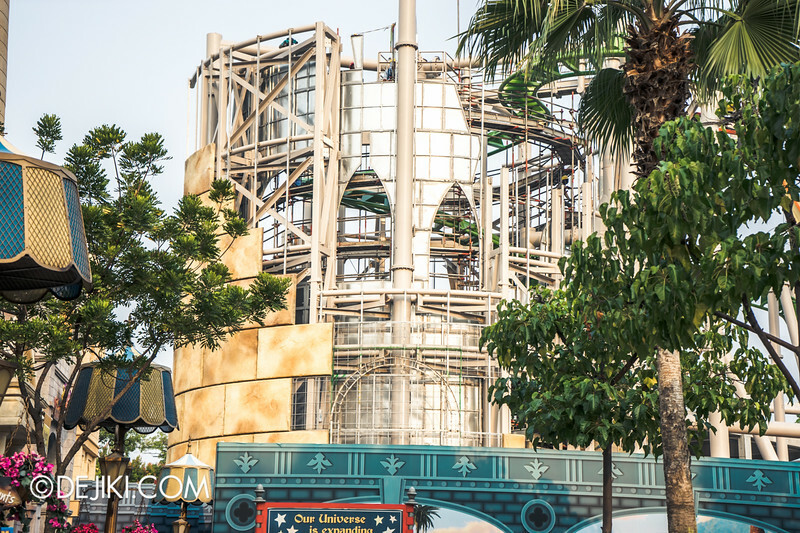 The ride vehicle will “fly out” of this tower. There will be windows to provide riders with glimpses of Romeo Drive as the spiral lift hill brings them up into the air, before emerging out of the tower at the top. Let’s all hope that the park can get the ride open in time! THE REVIEW: Why should go to HHN4 this year? With four haunted houses, four scare zones and an all-new stage show, there is so much to experience at this year’s Halloween Horror Nights. Read the review and find out what’s great, what’s scary and what will shock you!. 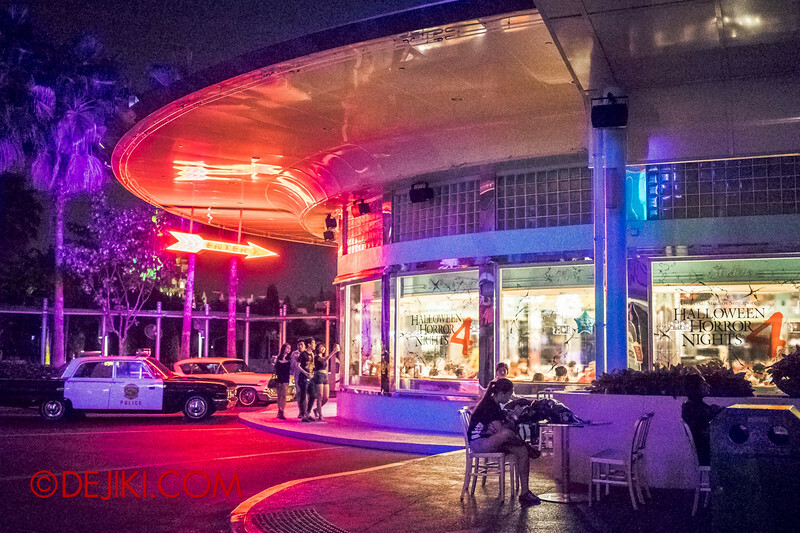 You can make the best out of your night at HHN4 after reading my 2014 Survival Guide to Halloween Horror Nights 4, which includes some handy strategies to save time and money! Every night during HHN4, the Minister of Evil will arrive to open the park. This is also known as the Opening Scaremony and it is held at 7:30PM. You have to be at the park early to get a good spot to watch it. Anyway you’re in luck, because you can witness the grand spectacle here with great photos and even multi-angle video of the whole proceedings. Every year I get requests for photo tours of scare zones and haunted houses. For HHN4, each new attraction will have a special feature, and you can view them all at the HHN category index. The features will be published throughout HHN4 season, to both tease people who are thinking of going, and also as a way to look back at the good (haunting) memories for those who have already went. For now, we have features on The Minister of Evil, Jack’s Nightmare Circus and Bogeyman. Stay tuned for more! 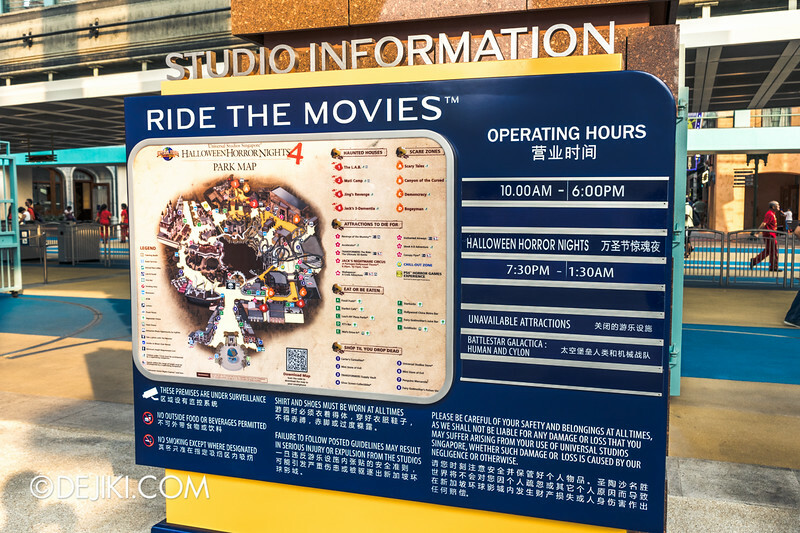 The Studio Information boards at the park entrance have been upgraded. 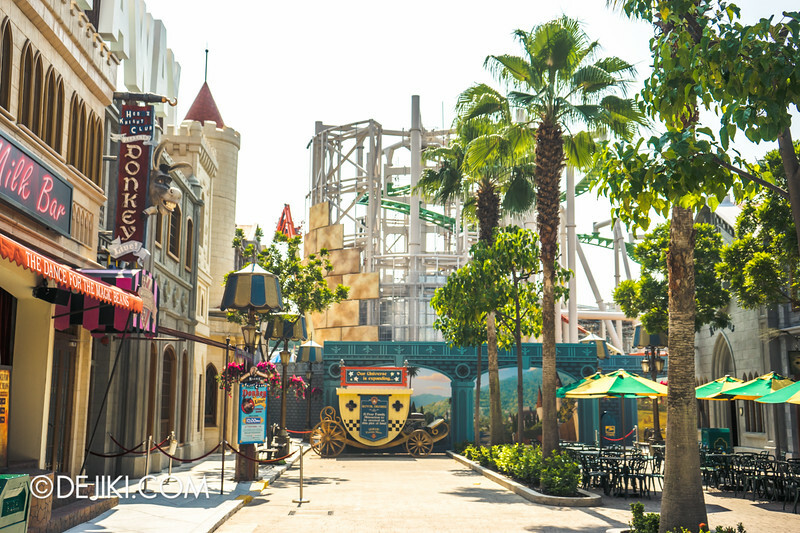 Now, new park guests can get an overview of the park’s layout and attractions before entering the park. 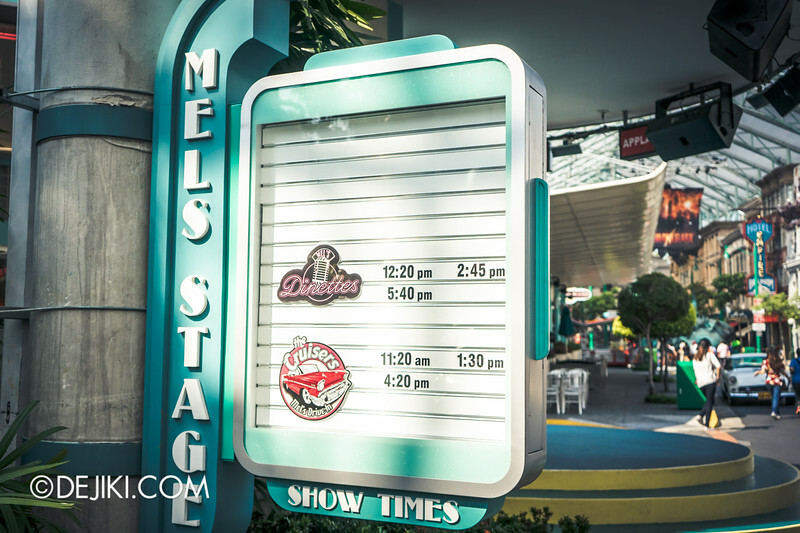 Need to know when you can meet the stars of Mel’s Stage? The Show Times board has returned! It looks like the Daddy-Os are either on hiatus or have retired for good. The Minister of Evil’s Rolls-Royce, for his personal use only. Please do not touch! 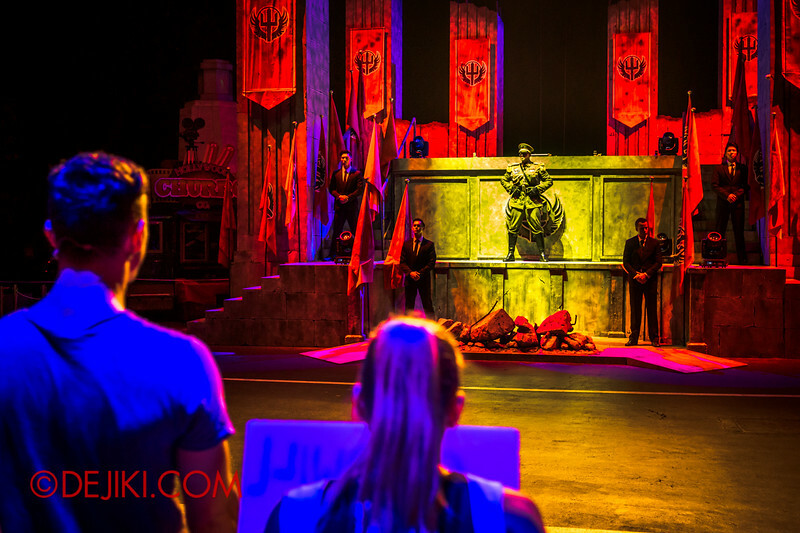 If you still need some convincing on whether to attend this year’s HHN, have a look at The HHN4 review and discover the Minister of Evil’s new world order of evil. You will also find out more about the new stage show and the four haunted houses and four scare zones. That’s 9 things to do, on top of some of the park’s blockbuster attractions! I’ve already done the footwork for you, my readers, and published a guide filled with killer tips and tricks. I know buying the $50-70 Express Pass is a difficult decision, especially when you’re going to the event with a big group of friends. What is the No Express Pass strategy? Get more information about that in our 2014 Survival Guide! 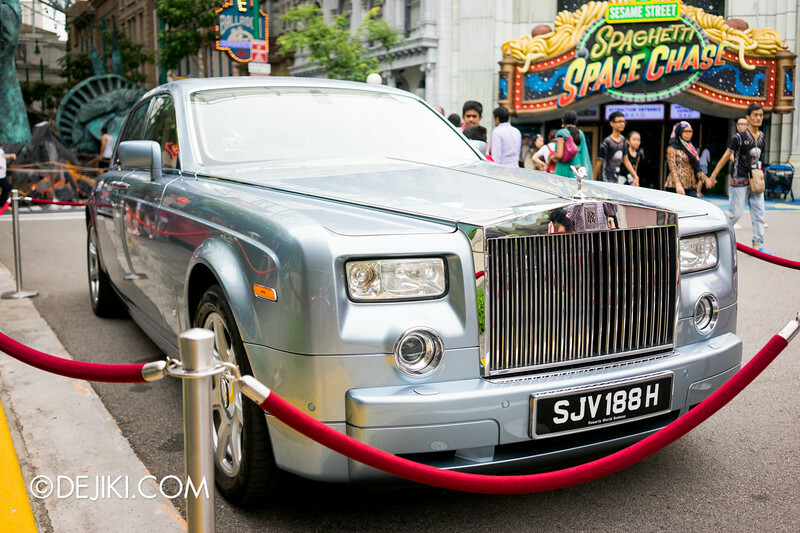 Should you decide to be brave and want to buy tickets HHN4, you can grab all the event and ticketing information you need at the 2014 Guide to Halloween Attractions in Singapore here! Hmmm… I thought they were gonna change it to a fast and the furious themed ride….oh well. That is excellent news! Looking forward to seeing it running again! Can’t wait to ride BSG again! Any new characters for October? Just joking. Not at the moment! HAHA. Yeah I regret not meeting the Easter Bunny! I did see the Easter show though. I am really glad that the park has a number of unique characters including the Mummy Characters and of course Kitty Softpaws! Based on your reply, I think I saw you at the park last Sunday.. quite a few times in fact! I believe I saw you at Dance for the Magic Beans and Madagascar Boogie. I remember because you (I think) were dancing along very enthusiastically! Yes, I agree with what you’ve said and I do think that the characters at USS aren’t very lively. It was different when I was at USJ in June. Woody was really active! They signed autographs too, and this is something that the animated characters here do not do. I understand there may be restrictions but I just thought there could be more interaction. Also, it seems a lot of face characters (Rick O’Connell, Evy, Ardeth Bay & Fairy Godmother) are gone and that makes me a little down because my most memorable interactions come from them, as they can converse and sign easily. I still do like the current lineup but just a thought. It’s also about time for more rides, and I hope the Puss in Boots ride and re-opening Battlestar will not disappoint! Whoops, Looks like I have been fully exposed! Yea that is me! I was there on Sunday. (In fact every weekends – You will see me very often!). Madagascar Boogie is now my main meet and greet sessions every weekends. just wondering, Im planning to go there at the end of march 2015.. will the BSG open yet?? am really hoping it’s opened already..
Heard they are going to change the ride’s name only as ‘Battlestar Galactica’ doesn’t have any impact on its guest. Was expecting it to be re-named either to Batman Return or maybe the Avengers… BUT, it’s better late than never to re-open this exciting ride again.. Can’t wait for December!! it’s very unlikely that the coaster be themed to DC or marvel (Disney owned) since universal does not have the IP for them here in sg. Hi just wondering. If I wear spectacles, is there a place I can keep them while I ride BSG? Or do I have to put it in the locker and walk through the whole queue like a blind bat? Are they changing the safety harness to a over the shoulder kind or is it going to be the lap bar type for BSG and PUSS IN BOOTS ride? Thanks! You can wear your spectacles and leave it on a box beside the platform as you board the BSG ride vehicle. It’s placed so it’s easy to collect on your way out. 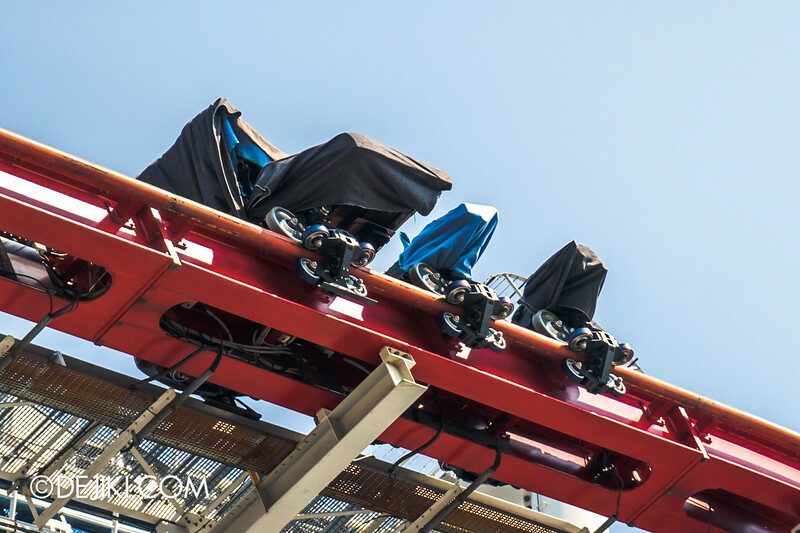 The Battlestar Galactica ride vehicles use over-the-shoulder restraints. As for the Puss in Boots attraction, it has yet to be revealed. I really hope that BSG will open soon! when i wanna try it they said it was closed 🙁 I really wish that they could reopen before school starts next year! 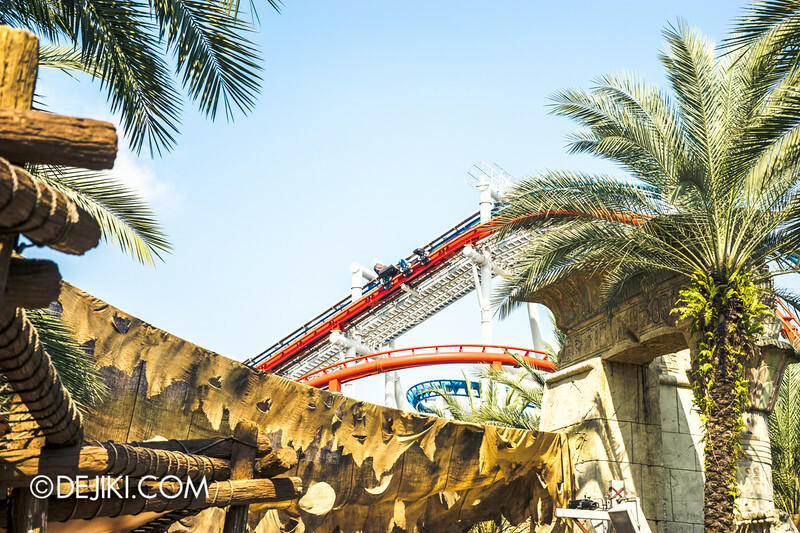 Three attractions in USS do not allow loose items in pockets, or bags to be brought into the queue, such as BSG (both HUMAN and CYLON) and Revenge of the Mummy. You have to store them in the park’s lockers or leave them with a non-rider. i’ve also heard that the lockers are free for the first 30min. is it true? Lockers are free to use for the duration of wait stated at select attractions (Revenge of The Mummy and Battlestar Galactica), with a minimum free period of 30 minutes.